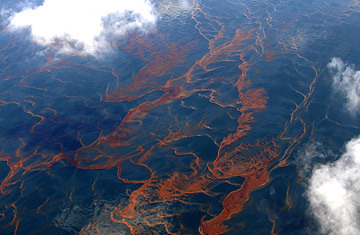 Massive sheens of oil are seen from an altitude of 3,500 feet over the Gulf of Mexico, off the coast of Louisiana. President Barack Obama does not like to get angry. His equanimity is his pride, and he rarely uses the bully pulpit of the Presidency for explicit criticism. But on Friday morning, Obama directed a rare showing of public pique toward the energy giant BP and the other companies involved with the catastrophic Deepwater Horizon oil spill  Transocean and Halliburton  each of which has dodged responsibility for the accident by repeatedly blaming the others, a pattern of blame they maintained during hearings on Capitol Hill on Tuesday. "I did not appreciate what I considered to be a ridiculous spectacle during the Congressional hearings into this matter," Obama said at a Rose Garden press conference Friday. "The American people could not have been impressed with that display, and I wasn't." The President is far from the only one angry with these corporations; BP alone faces thousands of lawsuits and has already paid out millions in legal claims. Yet while Obama was right to castigate the energy companies for the repeated failures that led to the accident  and for a truly shameful performance in Congress  it was later in his speech that he touched on an even more troublesome lapse  on the part of the federal government. In the weeks since the Deepwater Horizon exploded, reporters and environmental groups have unearthed disturbing proof that the Minerals Management Service (MMS), the Interior Department agency that is required to get permits to allow offshore drilling, failed to do any meaningful regulation of offshore drilling. If the energy companies got away with murder before the spill, MMS watched them do it  and did almost nothing. "For too long, for a decade or more, there has been a cozy relationship between the oil companies and the federal agency that permits them to drill," said Obama. "It seems as if permits were too often issued based on little more than assurances of safety from the oil companies. That cannot and will not happen anymore." While Obama got mad, the oil kept spilling from BP's partially blown well in the Gulf of Mexico. So far, nothing has yet worked to stop it. Last weekend, attempts to cover the leaks with a 100-ton containment dome failed. Now BP will try to insert a tube into the leaking pipe, and channel oil up to a drill ship on the surface. If that fails, the company will attempt to lower a much smaller containment dome  called a "top hat"  over the leaks. "We know the most important thing to do is find a way to stop the flow as expediently as possible," said Doug Suttles, BP's chief operating officer. "The concept of this is simple, but the simple problem is actually employing it at 5,000 feet." The good news  such as it is  is that the oil has yet to make landfall in a severely damaging way. Projections from the National Oceanic and Atmospheric Administration have placed little oil much west of Louisiana, with most of it bunching near Breton Sound and Venice in the southwest of the state. Responders have put into place more than 1.2 million feet of shoreline boom to keep oil at bay, and federal authorities have approved the use of chemical dispersants applied directly to the leak, deep in the ocean. Meanwhile, Louisiana officials are considering reopening some fishing areas east of the Mississippi Delta that had been closed due to the threat of the spill, and Florida's tourist-friendly shores are also open, free of oil. "We're relying on the weather which is very dynamic," said Coast Guard Rear Admiral Mary Landry at a Friday press conference. Still "the vast majority of the Gulf coast has seen no impact from this spill." But if the oil keeps bleeding into the Gulf unabated, that simply won't be true for long. There are growing concerns that the government and BP's rough estimate of the spill rate  about 5,000 barrels a day  could be far too low. In an analysis carried out for NPR, independent experts lookED at a video of the underwater oil spill  a video BP refused to make public for days  and estimated the true rate of loss. They put the spill at a range of 56,000 to 84,000 barrels a day­  although it's not clear from the short video whether all of flowing substance in the image is oil. Even the low estimate, however, is more than 10 times the BP number, and it would mean that the Horizon spill has long since passed the Exxon Valdez, which poured 10.8 million gallons into Alaska's Prince William Sound. Questions over the speed of the spill now have the attention of Congress. "I am concerned that an underestimation of the flow may be impeding the ability to solve the leak," Democratic Representative Edward Markey said Friday in a letter to BP. As BP and the Coast Guard desperately try to cap the well  which BP CEO Tony Hayward has said contains at least 50 million barrels of oil  the Obama Administration is trying to belatedly fix the major regulatory problems at MMS. According to a report in the New York Times, MMS gave permission to BP and dozens of other energy companies to drill in the Gulf without getting the necessary permits from federal scientists on the potential impact to endangered species and marine animals. All too often, MMS seemed to ignore pleas for caution from scientists, and took energy companies' word on safety issues without double-checking. "Under [Interior Secretary Ken] Salazar's watch, the Department of the Interior has treated the Gulf of Mexico as a sacrifice area where laws are ignored and wildlife protection takes a backseat to oil-company profits," said Miyoko Sakashita, oceans director for the Center on Biological Diversity, which is suing the Interior Department over the permits. The Obama Administration puts much of the blame on former President George W. Bush, who presided over a period of notorious deregulation. But at least some of those practices have continued into Obama's time in office. Earlier this week, Salazar announced that he would be splitting up MMS  separating the wing that controls oil and gas royalties from the one that actually oversees permitting. The agencies in the federal government share that responsibility," he said. "I will not tolerate more finger pointing and irresponsibility." But more than words will be needed, and for all his condemnation of oil company executives' sloughing off of blame, Obama has been doing some of that himself. The BP oil spill has exposed the fact that federal regulation of the fossil-fuel industry has all the toughness of tissue paper, and that the country will remain vulnerable until it breaks its addiction to oil. That's one thing even cool Obama should be able to get mad about  and stay mad. Read "BP: Oil Siphon Captures About 1,000 Barrels Daily." See how to assess the damage from the oil spill. See pictures of the oil spill.